Try this recipe made with juicy, sensual mangos. 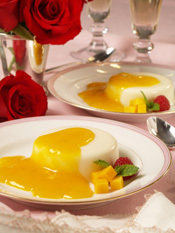 Silky smooth Buttermilk Panna Cotta with Mango Sauce offers an intriguing combination of bold, tangy buttermilk with sweet and tropical mango sauce. Stir together cream and sugar; simmer until sugar has dissolved. Whisk in gelatin until dissolved then stir in buttermilk. Pour into two 6- to 8-ounces heart shaped molds and chill until set. Meanwhile, simmer pureed mango, wine, sugar and cinnamon over low heat for 10 minutes. Let cool and remove cinnamon stick. Unmold each onto a dessert plate and top with mango sauce. Serving Tip: Let chill for several hours.